Webcam Model Agency | The highest paying Webcam Modeling Company is now hiring webcam models from all over the world! Webcam Models Agency recruits models for the largest online modeling network. We have many immediate webcam job openings for all types of cam girls and cam guys, so you can begin earning money in only a few hour in your home. technology, a world-class support team and millions of visitors each day! still remain 100% anonymous. So what are you waiting for? 70% weekly payout with no chargebacks or minimums. 10% commission for referring other models. 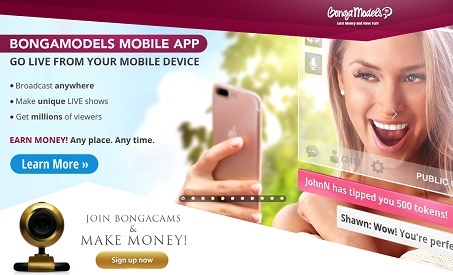 Sign-up now and get your mobile app and start making money anywhere! Click Here! Watch webcam models who have signup at WebcamModelAgency.net and see what they are doing! This service is intended for use by adults only. By selecting any of the options you acknowledge and confirm that you are 18 years of age or older. All models are over 18 years of age. All webcam video chatrooms on this service are offered by independent persons, Webcam Model Agency exercises no control over the images displayed by them.